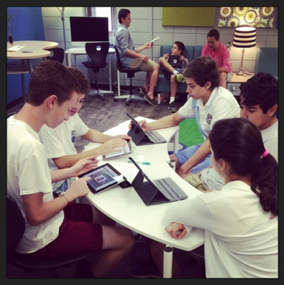 For our last day of class with a “normal” schedule (today), I met with my students in our school’s 21st-century learning space. There’s a sampling of flexible furniture, a corner with stadium seating, iMacs, a big-screen TV, an Apple TV, tables that also serve as white boards… chairs on wheels, couches with charging stations… it’s a great space! Students’ first task today was to finalize their multi-touch math books and submit them to me. Since some student groups were able to virtually turn in their books last Friday, I was able to embed their .ePub files on my teacher website, and use each unique URL to share all of the books in a ThingLink. 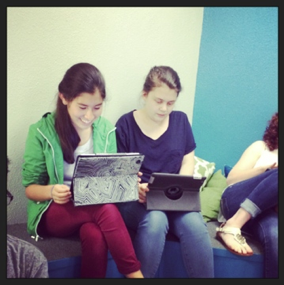 Student groups downloaded and read no less than five books authored by their peers. Blue, green and yellow “nubbins” in the ThingLink will provide .ePub files that are viewed quite nicely in iBooks. Since this was our first Book Creator experience, and it wasn’t “graded”, I learned a lot about how I might change this sort of task for next time (when it *will* be “graded”): 1) I’d definitely create a very specific checklist or rubric. This time, I wanted to see what features students gravitated to when few requirements were given. I’d like to see more variety as far as tools and apps for content delivery from some student groups. We’ll do a better job next time to take full advantage of this being a multi-touch book with interactive features. I also need to do a better job of “quality control”. I hate to say, “It must be so-and-so number of pages with such-and-such media” but these kids need that kind of structure. Some projects are great, and some are sub-par. 2) I’d provide a structured way for peer review before submitting the books to me. This time, *I* tried to intercept errors (if you download a few books, you’ll see I didn’t omit them all this time and wanted to feature student work for the sake of discussion even with errors). 3) I’d have a specific list of math book topics for students. Whether I generate the list, or we create it together, it will be less of a free-for-all next time. We’ll author books for a specific purpose (Preparing for semester exams in December? For STAAR testing? As a summarizing project each quarter in replacement of a traditional “test”?) Do you have checklists or rubrics to share that might fit a task like this? Any advice or suggestions based on your own experiences? Feel free to share in the comments section. Thanks to Dan Kemp for featuring this project on the Book Creator blog! 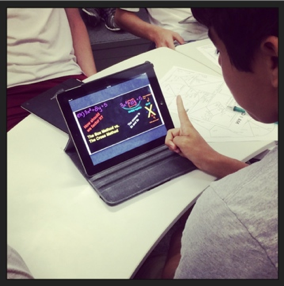 This entry was posted in Algebra 1, Pre-Algebra and tagged Algebra, Book Creator, Explain Everything, iPad, PhotoSpeak, Pre-Algebra, Tellagami, thinglink. Bookmark the permalink. Your last two posts could not have come at a more perfect time! 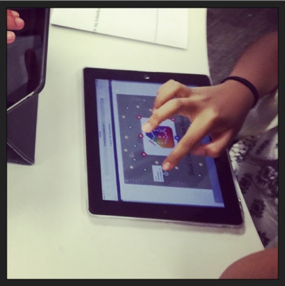 I love using Thinglink in my middle school classes (science and math), and my students love it. I have also used Explain Everything and Voicethread with them, too. 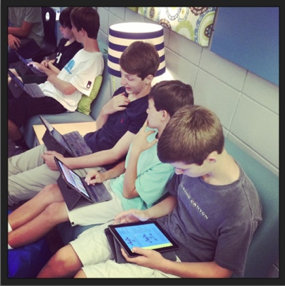 As we will be going 1:1 iPads next year in the 6th grade, I have been looking for other ways for students to create– some of my students like Explain Everything and others can’t stand it! Book Creator has been on my short list to try with kiddos, and you have inspired me to give it a go as an end of year project. There’s no time like the present! 🙂 As much as it would be nice not to give too many ‘you musts’, I agree that middle school students need structure. I think it is possible for create a framework that still allows for student choice and creativity. 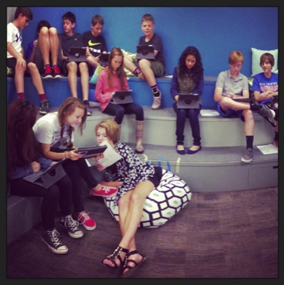 Thank you for sharing your ideas and experiences so openly– I can’t wait to see what my 7th graders create. Great! I would love to hear how things go with your students! Hey Cathy–Ok, major question. Once they create their books, what is the best way for students to get them to me? Should they upload the book to Drive and then share it with me? I am unfamiliar with how to work with epub files and how they can become a link that I can work with. Any advice? Thanks! Since our district subscribes to eBackpack, I created an assignment in each class folder and had students upload the ePubs there. Students could do the same process using Google Drive as well. I was able to get each ePub file to have its own link by uploading them all to my teacher website (we use Weebly) on a page that is not accessible from any of the tabs on my actual website (essentially, it’s a hidden page). When I right-click on each uploaded ePub file, I chose “copy link” and used these URLs in my ThingLink. Happy multi-apping!